Her Fall-Winter collection mainly consists of multicolored printed tights and tunics, inspired by The Little Prince with the presence of stars and other whimsical storybook prints and characters (do I see little twin stars here? 😛 ). Some colors are bright and shiny, while others are subtle sans losing its edge. 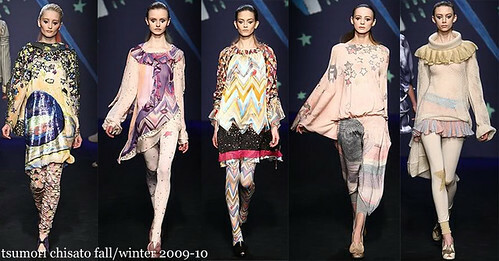 I like this collection and found it really cute, bubbly and uplifting! View more of the collection. 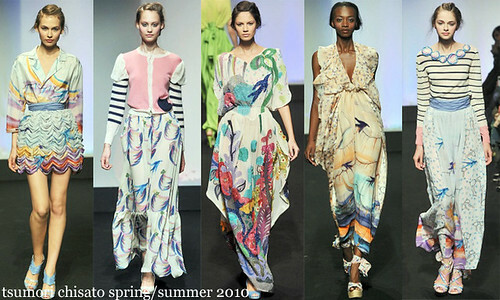 On the other hand, I got mixed feelings on her latest Spring-Summer 2010 Collection. Of course, Chisato’s signature prints are still the highlight of the whole collection, albeit it’s a tad bit subtler this time around–more like a Japanese painting. Also, notice how breezy most of the materials are. Texture, drapes and frills are conspicuously present in some of them. View more of the collection. 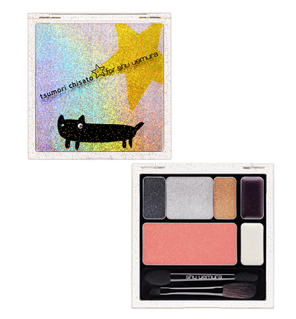 The collection consists of palettes, a highlighter, mini brush set, lipsticks, make up bag and studded false eyelashes in its shiny, shimmery packaging. Has a royalty damage of $65. Available at Shu-UemuraUSA.com. HeyWhereYou is turning one year old this month, and they’re inviting you to their private sale party next Sunday, November 29 in Viktor Jeans Store, Trinoma Mall, Quezon City. Avail items up to 50% off on clothing and accessories featuring brands such as Glamour Kills, LRG, Royal Elastics, Fox, Odd Men Out, Cartel NYC, Rockett, Lore Clothing, Electric Zombie and Viktor Jeans. Entrance fee is at Php 100 only. More details on how to RSVP here. I’ve been battling dandruff for years, and I haven’t tried any topical product that works and cooperates very well with my flaky scalp. For somehow, my dandruff problems were put to a halt during the time I was taking isotretinoin (anti-acne oral medication that shrinks oil glands, keeping the grease at bay). But, I must say taking this drug requires a great deal of patience and effort, since it entails so many contraindications–something that I won’t risk to try again. I stopped taking the med ever since my skin cleared up, and so my dandruff boo-boos started to show signs. I started loving Kerastase when I got Oleo Relax back then, but I got little to no time spending on such meticulous hair treatment. Recently, I got Kerastase Oleo Relax Nuit, a night time leave-in treatment which smells and works wonders as well in making my hair uber-soft and more manageable (reviews soon!). 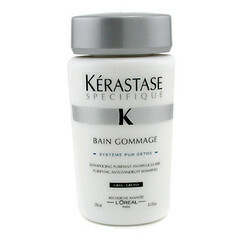 Much to my dandruff annoyance, I also got Kerastase Specifique Bain Gommage. It’s an anti-dandruff shampoo meant for dry hair. My hair has long been dried out, so I got this instead of the oily hair variant. 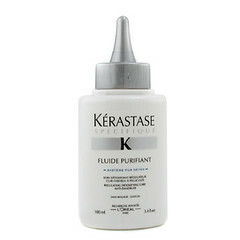 For more aggressive treatment, a coupled it up with Kerastase Specifique Fluide Purifiant, a leave-in serum that purifies, softens and re-balances flaky scalp for a much lasting dandruff-free hair. I have used the products for 5 days straight. I must admit that I’m not super happy about the products, although I’m glad that the shampoo somewhat helped soothing the itchiness sans over-drying my hair. The purifying fluid, on the other hand, perhaps contributed in lessening the flakes. Unfortunately, both still didn’t do a lot in completely nixing all the dandruff, albeit I could say that it virtually minimized the dandruff by a bit, something that cheaper products could also do (such as Nizoral). On the other hand, both smell kinda good; you’re gonna like it if you’re a man ‘coz they smell somewhat masculine.